Step beyond the red carpet at one of the most iconic theatres in America! Experience all of the renowned elegance and celebrity glamour that the Home of the Academy Awards® has to offer. On this tour, you will see an Oscar® statuette, the Dolby Lounge and other exclusive celebrity hot spots and you can view images from previous Academy Awards® ceremonies. Inspired by the elegance of a European opera house, with state-of-the-art technical capabilities, Dolby Theatre has been host to many of the world's top performers including Celine Dion, Prince, Steven Tyler, Alicia Keys and the Dixie Chicks. 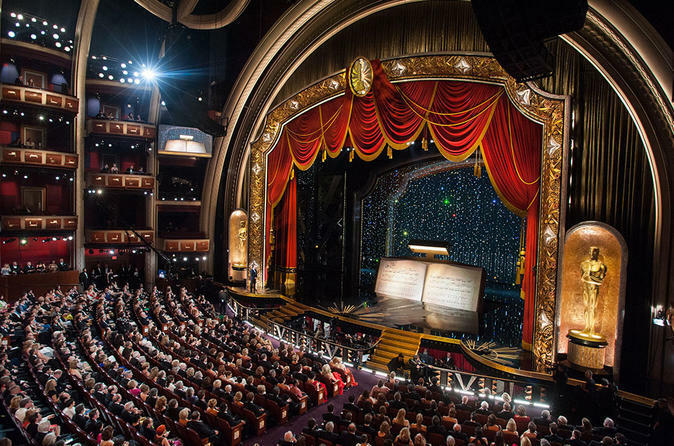 The Dolby Theatre also hosts high profile events such as The Daytime Emmy Awards, America’s Got Talent, The ESPY Awards, The Latin American Music Awards, the American Idol finals, the Star Wars: The Force Awakens world premiere, Victoria's Secret Fashion Show and many more. This is your opportunity to go beyond the red carpet and see inside this spectacular theatre. You will have the opportunity to see a real Oscar statuette, the Dolby lounge and you may even have the opportunity to step onto the stage (pending daily performances). Located in the heart of Hollywood at Hollywood and Highland, this is one attraction you don't want to miss!